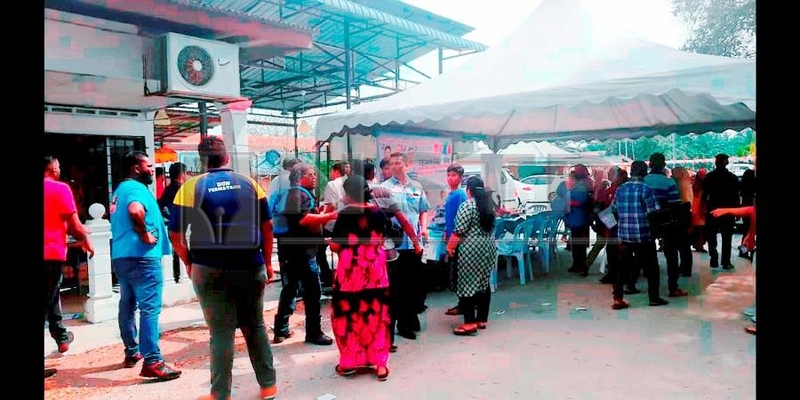 TANJONG KARANG: Chairs and punches were thrown at the PKR Tanjong Karang division polling today at Dewan Orang Ramai Kampung Sungai Gulang-Gulang, here. It is learned that the scuffle broke out between supporters of two division chief candidates following a bid to win over voters for their respective sides. In the incident, supporters attempted to coax party members to vote for their candidate of choice at the entrance to the hall, however things took a turn for the worst when it led to a fistfight and chairs being hurled. The fight lasted for about a minute before police and other party members stepped in. NSTP observation found police manning the area around the hall including placing officers at the candidates' tents.